It can be very difficult to place a cost on any type of project around the home. There are an incredible number of variables; including the standard of the finish; whether you will be doing some or all of the work yourself, and even what you intend to do. The cost of creating a fabulous finish in your basement will also depend upon whether you need to lower the floor to raise ceiling height or adjust the stairs to ensure they conform to code. This is not something which applies to most other projects within the home. However, a well completed basement renovation can add value to your property. 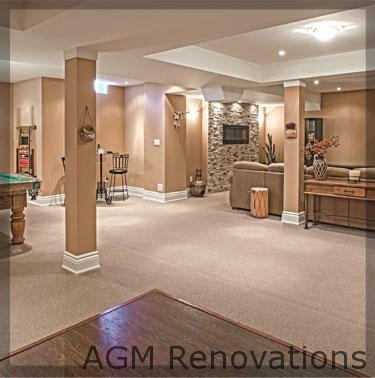 For inspiration and ideas on what you could do simply look at the projects AGM Renovations have completed. Before you can decide what it will cost you to finish your basement in just the way you want it; you will need to decide exactly what it is that you want! You may be looking to create an extra space where you can get away from it all and chill. Or you may be considering creating a whole new section of your house; adding an additional level and increasing the value of your home. The cost of your basement finish will vary depending upon the amount of rooms and equipment; such as showers or cookers, which need to be fitted. It will also vary depending upon the amount of the work you are capable of and willing to do yourself. The more you do the less the contractor will need to cover. This means that the cost of your project will range from $10,000 to as much as $35,000! You will need to have your basement checked for damp and may need to add the cost of damp treatment to your budget. The cost of this can be significant but it is essential to ensure your finished basement remains looking good. Some basements already have good clearance; however if yours does not meet the building regulations in your area you will need to see if you can remove pipe work and electrics to create the necessary height. Alternatively, you can lower a concrete floor. But this is a messy and expensive job which will certainly affect the cost of your project. Fitting a new kitchen and bathroom will add value to your property; especially if these items are being added to your basement and creating a whole new living area. However, this type of addition can also dramatically increase the cost of your basement finish. It is important to consider this before you start. Finally, in any project it is important to be as specific as possible regarding the detail of your project. This will allow you to create as accurate a cost as possible and ensure you have enough funds to finish your basement project; whatever the cost.